Your business uses Twitter to send out updates, but is your page properly optimized? You have a profile picture, a bio and your website. Great! However, is the information you have listed what your users want to see? Is it the best information? Don’t panic, we’re here to help your business make the most of your Twitter page! Twitter may seem like one of the least-used social channels, but it is still an extremely valuable tool for your social media strategy. 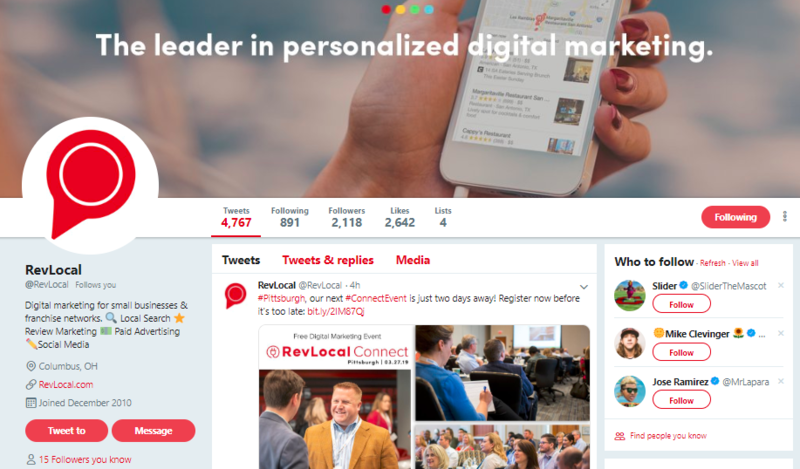 Below is a screenshot of RevLocal's Twitter page you can use as an example as you optimize your Twitter page! This may be the easiest step when optimizing your Twitter page. First, it’s important to choose a profile picture that represents your business. Most companies use their logo as it’s recognizable to users. Remember to use a logo that is simple and can fit within the space requirements! Your business can also utilize the cover photo space for branding. This is a great spot to show off your business’s creativity and bring some color to the page. You can use this space to incorporate your logo or mascot (if you have one). The last important step of this tip is to make sure you choose an appropriate handle. Nowadays, if you’re creating a Twitter account from scratch, it will automatically give you a handle. However, it’s important to know that you can and should customize it! When creating a handle, you should make it recognizable and easy for users to remember. If possible, keep your social media handles consistent. Twitter does have a 15-character limit, so you may have to use a shortened version if your Instagram or Facebook handle is long, as their limits are bigger! Bonus Tip: Stay away from unnecessary punctuation or numbers in your handle! Keep it short and sweet, but on brand to your business. With only 160 characters to use in your bio, you have to make the most of it! Your bio should briefly explain your company and your brand, list any accomplishments or services you offer and include any relevant hashtags. It’s essential to keep your bio focused on a specific audience, that way it will attract more people. If you work with another business, feel free to tag them in your bio as well! You can also use emojis (if they make sense) to add a layer of fun to your page! Twitter may seem like the world of hashtags, but you want to be careful of how many you’re using! Using one or two hashtags will get you 21 percent more engagement. Not only should you be using them, but the hashtags should be relevant and appropriate for your business. RiteTag is a great tool you can use that helps you find trending hashtags during real-time. You can also use your own Twitter analytics to help you find popular hashtags. Unlike many other social channels, it’s totally acceptable to send out multiple tweets per day! There have been many studies on when the best time to post is, but we’ve found from personal experience that early in the morning or mid-afternoon is ideal. On average, tweets only last for around 18 minutes, which makes it important to send multiple tweets out per day. However, how many tweets you send out should depend on your strategy! If you want more engagement, tweet more often (ten times per day should be your cap). A happy medium would be to send out three to five tweets. In the end, you should do what’s best for your business! This tip may seem straightforward, but it’s so important to use images in your tweets. In fact, tweets with images can receive 89 percent more likes! Think of it this way — if you’re scrolling through a Twitter feed, are you more likely to stop and read someone’s text-only tweet or will an image catch your eye first? Not only do images do well, but videos outperform them! Keep in mind that Twitter videos have a length limit of just over two minutes. GIFs are also a great way to get user engagement. Twitter has thousands of GIF options, so I’m sure you’ll find one that fits with your tweet! Using images and videos are great options, but GIFs allow your brand to show off your personality. Since Twitter is the most laid-back social media channel, in my opinion, I think it gives businesses the opportunity to really show their true colors. Twitter may seem like a tricky social media channel to optimize, but it’s easy if you know where to start! As always, use our tips and adjust them to your specific business. And if you’re still unsure what’s best for your Twitter page, our social media plan can help!